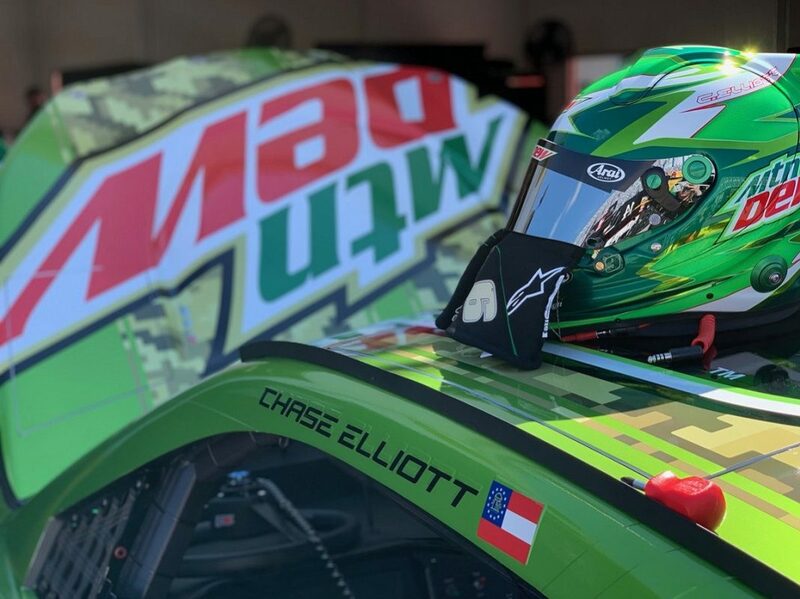 DAYTONA BEACH, Fla. – Contact between Chase Elliott’s Chevrolet and Ryan Newman’s Ford led to the first multi-car crash of Daytona Speedweeks during Advance Auto Parts Clash practice Saturday morning. Elliott was leading the Ford of Aric Almirola when he got shuffled out of the bottom lane exiting turn two and began dropping back in the middle of three-wide racing on the backstretch. After Paul Menard successfully passed Elliott on the outside, a fast-closing Ryan Newman tried to close the open hole to Elliott’s right, but Elliott was already drifting up the track and the two ultimately made contact, with Newman’s machine hooking Elliott into the outside wall. As Elliott went spinning through the pack, Denny Hamlin nosed into the outside wall before taking an excursion through the grass, while both Newman and Kevin Harvick sustained minor damage from spinning as well in the aftermath. “I don’t really know what happened,” said Elliott after being released from the infield care center. “I know Aric (Almirola) and I were trying to get up to speed, and he went to the bottom … so I thought, ‘well OK, I’ll go to the bottom,’ but that hole closed up and I had to ride it out in the middle. Hamlin was an innocent victim in the chaos and his No. 11 Toyota arguably sustained the most damage. Harvick’s son Keelan gave him a four-leaf clover earlier in the week during his Happy Hours radio show, perceived luck that the 2014 Cup champion referenced in his interview after getting back to the garage. “I guess it’s all in how you look at it, right?” Harvick joked after being released from the care center. “Our Busch Beer Ford was running fine. I was just trying to be careful in the back, and I don’t know what happened there in the middle. I hit the car in front of me – the No. 11 (Hamlin) – and it just started wheel-hopping when I got on the brakes. A nearly half-hour wait in getting Harvick and Newman’s cars back to the garage from the backstretch was due to NASCAR allowing both teams to replace the flat tires on the two Fords so that they could be driven back to the garage safely. Neither driver will go to a backup car as a result. In surveying the damage to the front of his No. 4 Ford, Harvick cut his hand, but noted afterward there was no real harm done. Joey Logano led the speed charts with a best lap of 45.735 seconds (196.786 mph) in the No. 22 Shell-Pennzoil Ford, ahead of Jimmie Johnson, Austin Dillon, Elliott and Harvick.